The INFINITY all- purpose shovel has a large capacity 13.5 inch black blade ideal for walkways, stairways and heavy snowfall. It has a bright red shaft with d-grip poly handle. It is robust and suitable for professional use. Proudly made in Canada for Canadian winters. Clear away snow without having to lift it with the Garant industrial-grade snow pusher. Designed for professionals, its 26-Inch polypropylene blade is 30% more durable than the traditional polyethylene blade. Plus, this tool is even larger, thereby offering a superior snow removal capacity. Also equipped with a fibreglass handle and a strong power-D grip. Make things easier for yourself by using this tool designed for large areas. Perfect for intensive uses. 40V iON13SS Cordless Snow Shovel with 13-inch Clearing Width Ideal for quick, easy and cord-free snow pickups on decks, steps, patios and sidewalks, the iON13SS Cordless Snow Shovel combines innovation and functionality to deliver the ultimate grab-n-go snow-busting tool. Powered by EcoSharp technology, Snow Joes patented rechargeable 40V 4.0 Ah lithium-ion battery system, the iON13SS delivers up to 40 minutes of whisper-quiet runtime with zero carbon emissions for cleaner air. 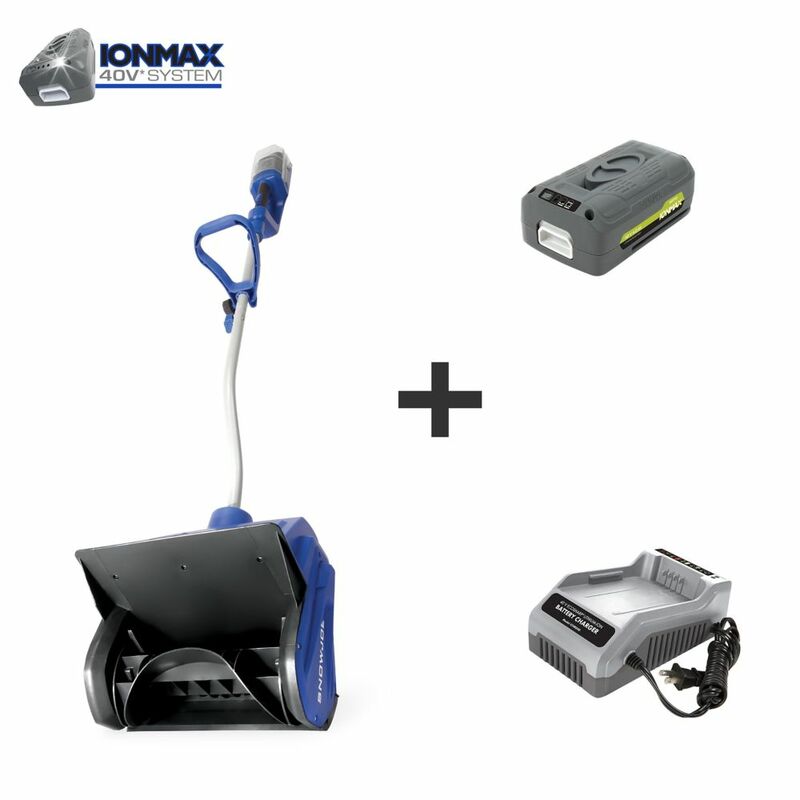 This snow shovel also features an innovative 500W brushless motor that increases the battery's efficiency and delivers the power to blast through 300 lbs. of snow per minute. The Snow Joe iON13SS starts instantly with the simple push of a button and its patented back-saving handle maximizes operator comfort during use. 40V iON13SS Cordless Snow Shovel with 13-inch Clearing Width is rated 4.0 out of 5 by 108. Rated 5 out of 5 by Kate from rechargeable battery I bought this to deal with snow on decks and patios where snow blowers cant reach. I read the questions and answer and understand that it is good on deck and driveway. What about on gravel paths. I clear the area to the bird feeders in the winter. Yes it does. &nbsp;The battery charge lasts a long time too. &nbsp; I use it for my large deck and driveway. &nbsp;Throws snow a good distance. 1. Does it come assembled? 2. Can it blow snow sideways? Hi,is it Steel auger with 2 rubber blades? Equipped with a heavy-duty plastic, 2-blade paddle auger, the iON13SS throws snow up to 25 feet, clearing a path 13-inches wide by 6-inches deep with each pass. Its durable scraper bar at the base of the unit lets you clear right to the ground without damaging your deck or pavement.